The scenes at the Winchester at the start of this one are great - Terry & Arthur out on a Saturday afternoon enjoying a couple of jugs together. Interesting dialogue during these scenes Arthur seems just as much into a bid of 'birding' as Terry is. His "don't suppose you get up the White City?" comment to the TWA assistant is also evidence of this. Dave also has a male assistant in the club in this episode. Up to Scotch Harry's drum, which looks well run down and Arthur's reaction to Terry opening up a can a SKOL is fantastic. The villains in this one are nasty and very cut throat and Phil McCall plays a drunk Scotch Harry very very well - "geeus one a they lagers". As has been mentioned elsewhere on the forum Phil McCall sadly hanged himself in 2002 ( link ) but I have to say I thought he was excellent in both his appearances in Minder. Also the first time we see Rycott who is much different in this episode to the others as in this one he is portrayed as mildly bent. Having watched this many times, he is clearly not entirely ‘straight’ in this one but his actual involvement with the team is never actually given in too much detail and we only know he has handed Scotch Harry to them on a plate. There is some good humour in this one, like at the cheap hotel where Arthur tells them they are all incognito when in fact the hotel owner knows every one of them! A little dig at the Scottish football team too with Terry saying mentioning Scotch Harry could have gone to Spain and then adding "Mind you, he'll be the only Scot there!" It is hard to imagine that Scotch Harry would be able to remember the name of the hotel where Arthur & Terry had him and Stan hold up and I suppose he must have had a right kicking off of Eric to have spoken up. I can't help feel a bit of satisfaction after Terry gives Eric a pasting at the end. Arthur is also very cut throat himself at the end of this one, dipping his hand in the suitcase to make sure he gets his share of the dodgy wedge, very funny to watch! This is a classic Minder story in my opinion, with it all coming to a natural useless conclusion at the end for Arthur as Dave says “that’s nine fivers Arthur”. Interesting that Terry also calculates in “fivers” in “Monday Night Fever” and maybe this was commonplace at the time to do so, I don’t know. At Scotch Harry's bedsit: "Obviously there'll be some disbursements involved." To Terry in the car: "We don't want to reveal out hand!" I'm pretty sure that I remember reading that this is the episode that made Dennis Waterman realise what the gist of Minder was all about. I've always loved this one too. Some excellent writing by Leon Griffiths & top performances from the cast. I would agree that this is a 10/10 as well. Series 1 is my favourite and this episode is an excellent example. An innocent Saturday afternoon drink turns into a classic early Minder story. Arthur and Terry moving around 'the manor' putting a deal together whilst Rycott is moving in on them is also top stuff. It's also amusing that Arthur thinks he's in the same league as the criminals he's dealing with, however they're obviously neither impressed or intimidated by Arthur as we see by the offer of a derisory £500 to clear off. I've always assumed Rycott's role to be one of using his position as a Police officer to keep his eyes and ears open around the criminal fraternity.In return, there'd be 'a nice little drink' from the money movers,for information that will see the briefcase back in their hands. He obviously put the word out that he wanted Scotch Harry hence that's why he got the phone call from the pub landlord. The beer can on the bedside unit looks like it could be 'Long Life'. Another classic episode for all of the above. Scotch Harry is superb, acted brilliantly by Phil McCall. For me he actually surpasses this in Return of the Invicible Man a few years later.... now that was a great episode. The regaular referral to Light Ale seems to be a London thing. I was a teenager in the early 80's and going for a Light Ale was what we did, even though we all drank lager!! Just a phrase, used by my old man before and still used by the boys I know today. And the BTB is right - that is a can of Long Life. 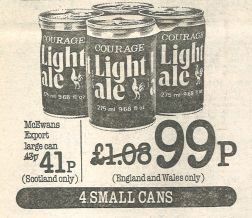 ...and the original stuff was a right bargain - this is from a TESCO ad from The Sun in May 1982 when 4 cans of Light Ale cost a mere 99p! No wonder Scotch Harry and his fellow villainous brethren liked it so much. During a quiet Saturday afternoon down the boozer, Arthur and Terry are approached by some dozy local who wants to know if Arthur has any ideas about foreign exchange; and if so, is there any chance he could swap a 100 dollar bill? Intrigued Arthur follows him back to his flat with Terry, whereupon they learn about an incident of airport lounge sneak thievery that could really make 'them' (Arthur!) some money. As it is, it turns out that the bag snatcher in question, is a little drunk with a big mouth, who goes by the name of 'Scotch Harry', who has stolen a briefcase containing half a million US dollars. With the only downside, seemingly being that he was spotted escaping the scene by a potentially bent copper named Rycott. Third episode made, this time directed by another ex-Hammer director, in Roy Ward Baker. Who I have to say, handles the pacing and action a little better than Sasdy did in the last two. This is a slightly darker, more balanced episode (in terms of character screen time), and I think that it benefits because of it. The support cast, as some have already mentioned in posts above, are uniformly very good, and I would certainly mirror any above comments praising Phil McCall's efforts as the drunken Scotch Harry. Although it was just as pleasing to see the likes of David Jackson (Mr Trubshaw from the sickopathic, Brit slashfest 'Killer's Moon' 1978).. And indeed Chris Jenkinson, playing the ex-SAS heavy, Eric, who incidentally went on to say the classic "And zis iz how ve zay goodbye in Germany, Doctor Jones.." in Indiana Jones and the Last Crusade! Personally I think this has been the best episode of the series so far, a well balanced and well told story, with plenty of good locations and a nice final punchline (and punch up!). Other points of interest being that 'Terry 10 Jackets', again changes his coat more times in this episode than I have changed mine in the last decade; and that this is the first episode in which policeman Rycott appears, in total he would feature in 15. No coats Arch? Just anoraks I suppose. Nice review and I never realised Terry's jacket count per episode was so high but will keep an eye out from now on that's for sure! Scotch Harry of course returns for 1 episode in series 6, a great idea but although Chisholm does a grand job it is not Rycott, who I would have loved to see go up against Scotch Harry again. A really good episode, one of my favourites, and Scotch Harry was an inspired bit of casting. There were a lot of Harrys around about where I stayed as a kid and Phil McCall played him spot on. I owned this episode on video and for some reason instead of the standard 2 episodes on the video it had 3, but not from the same series, it was a well fashioned fit up, but it was a great treat to watch the two episodes then to find another one after it had finished, not quite sure how they managed to do it, but I was very grateful. I always like the bit where Arthur & Terry are driving and Arthur mimics Scotch Harry: "Just get in there, in the words of Scotch Harry - Doo the bizzooo"! I watched this the other day having last seen it nine years ago I wanted to watch it again as it has one of my favourite Minder moments in it (more on that later) plus I remember it being an excellent episode. When I bought Minder on video I didn’t purchase them in order and series 1 was the second to last series I viewed (series 6 being the final one). I always remember being surprised as to how gritty and seedy it seemed with the original Winchester Club and Scotch Harry’s flat. Alexei Sayle once said about the 1970’s that he always remembers that decade being like a Minder episode with everything being grey and run down I’m sure he was thinking of this episode when he said that. It has a Sweeney feel to it this one and could be anytime between 1975 and 1979. For me Scotch Harry makes this episode it’s not easy for an actor to portray a drunk person in a believable way but Phil McCall’s performance is outstanding. Something that the average viewer is likely to miss (I had on previous viewings) is what Scotch Harry is actually drinking, did you notice? On closer inspection you see him mix three drinks in a pint pot, red wine, drambuie and lemonade (no wonder Arthur refers to them as ‘hypnotic cocktails’) its very subtly done and gives a little extra to those who are paying attention. From the then and now pictures on minder.org I was surprised to see Scotch Harry’s flat still standing and looking somewhat unchanged the downstairs windows look the same it appears to even have a green front door. The alleyway is also unchanged. There maybe another sighting of the orange VW Camper in this thats not listed on the dodgy motor photos on minder.org when Rycott parks his Marina outside the Market Bar to the left of the screen it looks to be parked by an orange Transit. On to one of my favourite Minder moments it’s probably one that most members on here haven’t taken much notice of but for me I think it’s great and it’s Arthur sweet talking the airline receptionist I think it’s the way he seems impressed with himself at being able to charm her to give him what he wants he then thinks I could be in here before saying “don’t suppose you get up the White City of a Saturday night do you” he then realises he hasn’t got a chance and says (walking away) “no you don’t”. Hilary Ryan who plays the receptionist was also in a Professionals episode (Man Without A Past) and she looks absolutely stunning in that (looks good in Minder too). She hasn’t been in anything since 1988 according to imdb. I once did something similar to this in real life I was in Swansea with some friends we had hired a limo and were ready to go home all the booze we bought had been drunk and I fancied a drink for the journey home so I wandered into this pub/hotel went up to the bar and called the (very fit) barmaid over the conversation went something like "you couldn't do us a favour could you I've got a limo waiting outside and we've run out of booze you couldn't sell me a takeout could you" "well I could but you wouldn't get it past the bouncers" "don't you worry about the bouncers love i'll get past them" after abit more chat/gentle persuasion she gave me the bottle I put it in my inside jacket pocket and walked out past the bouncers and into the limo. I know its not quite the same but at the time it reminded me of that Minder scene possibly because it's chatting a stranger up to risk their job to help you out. 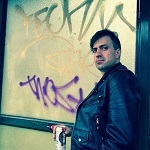 As with many series 1 and in some cases series 2 episodes Arthur is portrayed in a slightly different way, he’s a little posher (although not as much as in ‘Bury My Half At Waltham Green‘) he’s also not so tight with the money keen to cut Terry in on the deal (“something for me and Terry” and “we’ve gotta be earning on this”) he gives Big Stan (David Jackson played him perfectly) a choice on whether to choose ‘dollars or friendship’ and he’s quick to pay Dave back at the end of the episode. He also shows interest in women and is that bit braver and harder than the character would later become. Being a series 1 Leon Griffiths episode its fair to say that this is how Leon envisaged Minder with gritty locations, rough people living close to the law (bent law), Terry and Arthur trying to make afew quid but with some very gentle humour added to sweeten the sour and somewhat bleak existence of the characters and story. Superb post AW, love it! I forgot to add that a couple of years ago I met a man similar to Scotch Harry (well in voice and mannerisms) I was in my local and one of my oldest friends said "that Scottish bloke over there is funny whenever anyone asks him how he is he says 'brand new'" now this is what Scotch Harry says in 'The Return Of The Invincible Man' I told my mate who also likes Minder about Scotch Harry but he wasn't familiar with the character or episodes I asked him to introduce me to the guy (who was fairly drunk) and I said "how are you" he said "brand new!" I had a job keeping a straight face as he sounded just like Harry, I guess he came from the same part of Glasgow as Phil McCall. Lots of great little gems sprinkled throughout this episode. Arthur explaining how the rate of exchange works...the discussion of Yank airlines...hotel room service being across the street...Arthur's delusions of grandur about his status in life...and more. As everyone observes this is a fantastic episode, good in every department. 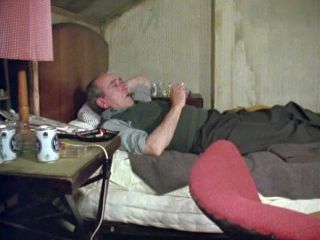 Lots of great lines but I really laughed when the four of them come limping out of the hotel and walk up to Rycott skulking outside and Arthur says to him "Who says you can never find one when you want one". They could have brought back Scotch Harry in series 2 or 3 rather than waiting until series 6. A great Minder character. My old boss was Northern Irish and he was a decent bloke but had a drink problem. When he'd had a few he'd exhibit a lot of Scotch Harry's mannerisms, especially the grandiosity and aggression. This would lead him getting into scraps with total strangers in pubs. He wasn't a big man, and he definitely wasn't in good shape so would often end up getting a kicking and would come into work on the Monday with bruises and worse on his face. 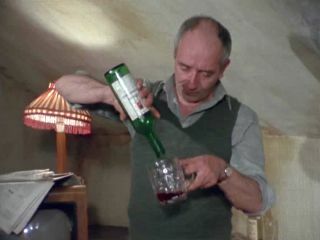 For me Phil McCaul's performance definitively nails a certain type of alcoholic and shows what a good actor he was. This is one of the Minder episodes I will always cherish. One of my favourite scenes is at the block of flats, when Arthur wrongfoots Eric. He is so pleased with himself. Also love the bit where Rycott drives past the nick and Scotch Harry realises all is not well. I think every actor in this one plays a blinder (ok maybe not the richard and the guy who had his case nicked) and that combined with excellent writing and gritty locations makes this a real Minder classic. 'I hate kebabs!' Laugh a minute this one. This is truly a great episode. I think I enjoyed it more the second time. 10/10? Agreed... I actually thought the episode was rather more adventurous towards the end compared to the first two episodes. I used to drink Light and Mild - which was light ale mixed with mild. The villains are very good in this one - I like it when Arthur and the gang fight them at the end. The 440ml Long Life can is from 1974, the Light Ale bottle is from last year, and the Light Ale can is 1979. Cheers! There are of course numerous 'Light Ale' references throughout Minder, but not even my anorak counter has kept track of 'em. I went to a wedding reception last month at a sports and social club, and was very happy to find that the bar stocked GREENE KING light ale in bottles, so I had a few of those. So at least 3 companiessl still brew it, COURAGE, SHEPHARD NEAME and GREENE KING. Starting back with Series one and aiming to work my way through, I found this episode quite slow going first time I watched it, but this repeat watching on my Umbrella box set I found better going. Some good laugh out loud moments, I loved Arthur telling Terry he would be going in and he was back up outside. Funny seeing Rycott as a possibly semi bent copper here too, I am giving this one a good 8.5/10. Just watched this episode again, really excellent. Scotch Harry and Stan are a great double act of feckless losers. Truly a top episode this one. Hilary Ryan who plays the receptionist was also in a Professionals episode (Man Without A Past) and she looks absolutely stunning in that (looks good in Minder too). Agree with you on that Albert -I preferred her to ex-Bond girl Susan Vanner who played Kim. Shame she didn't have a bigger part really. And here is Susan Vanner, must have been hard to keep a straight face with Roger the Dodger in his yellow jump suit!